All La Mesa homes currently listed for sale in La Mesa as of 04/26/2019 are shown below. You can change the search criteria at any time by pressing the 'Change Search' button below. If you have any questions or you would like more information about any La Mesa homes for sale or other La Mesa real estate, please contact us and one of our knowledgeable La Mesa REALTORS® would be pleased to assist you. "Located 7930 Hillside Drive in the La Mesa California, the property features expansive views while maintaining immediate proximity to commercial and retail developments that include: grocery, restaurants, and shopping. With immediate access to Interstate-8, this site will provide commuters with quick, convenient access and a short drive to all of San Diego, Orange & Riverside Counties. Neighborhoods: La Mesa Other Fees: 0 Topography: GSL"
"Located in one of Mt. Helix's most desirable enclaves, this pristine home's perch at top of bluff offers soul-stirring, 360 views of the Pacific, Pt. Loma, Coronado Bridge, mountain ranges and, at night, evening lights to Mexico lit up like the Milky Way! Inside, those views are showcased in every room by never-ending walls of oversized windows - like having 30+ flat screen TVs tuned into the Nature Channel 24/7! Builder/owner has invested some $600k in creating a perfect, indoor-outdoor paradise! Neighborhoods: Mount Helix Equipment: Garage Door Opener,Pool/Spa/Equipment, Range/Oven Other Fees: 0 Sewer: Sewer Connected Topography: ,LL"
"$1,050,000-$1,250,000. Incredibly Rare Opportunity To Own The 1st House Built on Grossmont's Artist Colony. 1910 Historic William Gross House w/Mills Act Designation. Of Special Note: Stained Glass Windows/Doors Designed by James Hubbell, Artisian Built Solid Walnut Spiral Staircase & Architecture That Reflects the Craftsman Stye in it's Original Detail. MAIN DWELLING - 2 Bed/2 Bath/2,000 Sq Ft GUEST HOUSE - 2 Bed/1 Bath/480 Sq Ft (Seller's Previously Used as a Rental) ART STUDIO 700+Sq Ft w/.5 Bath. Neighborhoods: Grossmont Equipment: Dryer, Range/Oven, Shed(s), Washer Other Fees: 0 Sewer: Septic Installed Topography: LL,GSL"
"Exceptional opportunity to own this amazing Mt. Helix custom built estate home with a tropical paradise backyard. 70 water slide, waterfalls, swim up bar, tanning shelf, rock cave, spa, and treehouse. Enjoy the views from the upper deck, or the 600sqft Tiki house with full bar and billiards table. Outdoor kitchen with double BBQ s, pool bathroom, multiple water features and pathways lead you through this private tropical wonderland. The home features a gated private driveway, lots of parking, 2 two car garages. The interior features open beamed ceilings, hardwood flooring, remodeled kitchen that opens to the family room and dining area. 2 bedrooms and 1 full bath located on the first level. Multiple French doors lead to the wrap around deck. Downstairs features another large bedroom, and the master suite with a walk-in closet, fireplace, seating area, and access to the backyard. New roof, solar, gutters, refinished hardwood flooring, reverse osmosis, nest thermostats, new pool motor, and Wi-Fi pool control are just a few of the many upgrades. This home has great rental potential VRBO, recently filmed for HGTV featuring the nations coolest backyard water park pools. Easy access to freeways, shopping, schools & more." "Beautiful La Mesa Meadows craftsman style home on a large lot on a cul de sac. Huge family room with bi-folding La Cantina doors that open to the covered porch for indoor/outdoor living. Huge chef kitchen features breakfast bar for 10, a ton of cabinets, and a butlers pantry. One full bedroom & bathroom downstairs, with a loft and 4 bedrooms upstairs. Master bed opens to a private balcony. Solar panels are included. Large 3 car garage with epoxy floors and a tankless water heater. Neighborhoods: La Mesa Meadows Equipment: Fire Sprinklers,Garage Door Opener, Range/Oven Other Fees: 0 Sewer: Sewer Connected Topography: LL,SSLP"
"Absolutely Stunning 2017 Built 4bed 3bath Craftsman Home! Rare Private & Serene Wooded Location w/an Abundance of Natural Sunlight in foothills of Mt Helix.Exceptional high-quality finishes.Vaulted ceilings w/8 ft doors,designer kitchen &baths,2gas fireplaces. His/Her Master Closets.4 door Samsung refrigerator &6 burner stove.1st Level Bed w/Full Bath.Beautiful Back Yard Amazing Sunsets 20,000+ sf lot next to seasonal creek.Oversized 2car gar +expansive driveway. Tankless H20 heater,smart meter irrigation Neighborhoods: MOUNT HELIX Other Fees: 0 Sewer: Sewer Available Topography: GSL"
"8720 Mariposa, showcases oak hardwood floor, copper hood in kitchen, stained glass in the breakfast room, exposed ceiling beams in the elevated living room, and outdoor fireplace. Dozens of mature olive trees, a fig tree, myriad citrus trees and carefully tended drought-friendly. With over 3,500 sq. ft., granite counter tops, lots of storage, and elegant master bedroom. Detached 2 bedroom, 1 bath guest quarters on lower level with separate entrance. Two garage, 4 car parking and work rooms. Neighborhoods: LA Mesa Highlands Other Fees: 0 Sewer: Sewer Connected Topography: GSL Guest House Est. SQFT: 400"
"This exquisite executive home features beautiful upgrades and is move-in ready. Easy care laminate floors flow throughout the downstairs, which features an office, living/dining room, kitchen/nook, family room with foldaway patio door, large laundry room with sink, and master suite. Gourmet kitchen boasts crisp white cabinets, quartz countertops, subway tile backsplash, spacious prep island, high-end stainless appliances, walk-in pantry and generous butlers pantry. Neighborhoods: La Mesa Meadows Other Fees: 0 Sewer: Sewer Connected Topography: LL"
"Over 4,000 sft on a flat half-acre to play, create, live & laugh in much luv ed Mt. Helix community. Quality workmanship & custom design merges function with mid-century modern style. Room for everyone & everything with a 5 bedroom/5 bath home and a separate studio rentable at ~$1,200/mo. Entertain easily with walk-out basement/rec room to large patio, pool with diving board & slide. Easy access from the attached garage with wide driveway for the boat, RV and 2nd garage. Opportunity awaits! Neighborhoods: Mt. Helix Architectural Style: Custom Built View: Custom Built Equipment: Garage Door Opener,Pool/Spa/Equipment, Range/Oven Other Fees: 0 Sewer: Sewer Connected Topography: LL"
"FULLY TURNKEY -BEAUTIFUL VIEW HOME-WITH OVER 3700 SQFT-PAID OFF SOLAR SYSTEM-MASTER BEDROOM ON THE GROUND FLOOR!This home shows like a model home & has amazing northern views! Built in 2005, this house is loaded with great features & upgrades!Large master bedroom on the first floor, living room 18' high ceilings & beautiful custom drapes, gourmet kitchen with all the bells & whistles & a Sub-Zero refrigerator, Kitchen Aid range, double oven, microwave and vent with a large bar, Island and more. See Supp! Neighborhoods: La Mesa Equipment: Dryer, Range/Oven, Washer Other Fees: 0"
"Tucked down a private drive near the top of Mt. Helix, this 1-story provides a respite for the world-weary with its panoramic views, Zen garden, beamed ceilings and open flow. Sipping coffee from the eat-in kitchen while watching the sun come up over the eastern sky, the site's tranquility is evident. Built-ins, uplighting for art, skylights, covered patio, private lanai, fish pond, waterfall, large lot and private location make this a true retreat. Separate suite of rooms makes an ideal guest quarters. Neighborhoods: Mt. Helix Equipment: Dryer Other Fees: 0 Sewer: Sewer Connected Topography: ,LL"
"Plan 6 within Serramar community. Enjoy your own POOL & SPA in your oasis backyard. Totally upgraded home with 4 beds, 3.5 baths, gourmet kitchen with center island , built in fridge, double ovens, granite counter tops, large family room, downstairs master bed with view and direct access to pool/spa. Upstairs are 3 bed, 2 bath, a supersized bonus room, and alcove with built-in desks. Escape to your own oasis as you lounge by this tranquil pool/spa and enjoy the east county blue sky and ultimate experience Neighborhoods: Serramar Equipment: Range/Oven Other Fees: 0 Sewer: Sewer Connected Topography: LL"
"Enjoy stunning panoramic views from almost every room in this exquisitely designed Mt Helix home. Refinished Hardwood, Eurostyle cabinets, Silestone Quartz, Italian Porcelain, Large view deck, Restoration Hardware lighting, Milgard windows, New Synthetic Stucco & Roof, Custom fireplaces, Grohe/Moen Fixtures, Lutron, Custom door hardware, Expertly landscaped. No expense spared in this updated hilltop retreat. Enjoy a soaking tub with an incredible view in the 700+SF master suite. 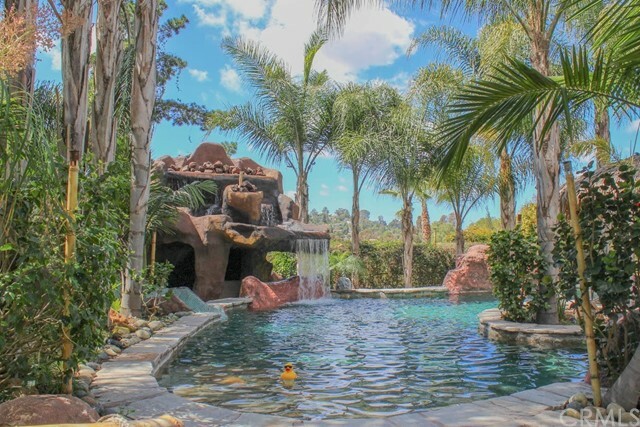 *See Supplement* Neighborhoods: Mt Helix Equipment: Garage Door Opener, Range/Oven Other Fees: 0 Sewer: Sewer Connected, Public Sewer Topography: GSL"
"Tucked away in a secluded setting at the base of Mt Helix, this gated single level estate is truly one of kind. The large lot boasts a mid-century style ranch home with a mature avocado grove, pool, electric solar, and panoramic easterly views. The spacious floor plan features an open living room with wood floors and a grand fireplace with large plate glass widow that frames in the distant mountains. The private pool and spa setting is like no other, surrounded by a flagstone wall and gazebo covered deck! Neighborhoods: Mount Helix Equipment: Dryer,Pool/Spa/Equipment, Shed(s) Other Fees: 0 Sewer: Septic Installed Topography: LL,SSLP"
"Incredible Views for miles! Stunningly remodeled home showcases SDSU, Downtown, Silver Strand, Coronado Bay Bridge, and Point Loma as the skyline. Boasting over 3200sq ft, this 4bed/3bath home features, heated pool & spa, new paint and hand textured walls, slate floors, custom cabinets with quartz counter tops, brand new appliances & dumb waiter. Tons of closets & interior storage space including a walk in closet in master. See more info below... Neighborhoods: Windsor Hills Equipment: Pool/Spa/Equipment, Range/Oven Other Fees: 0 Sewer: Sewer Connected Topography: SSLP"
"Huge 1 acre prime Mount Helix property! Zoned spittable for two homes to sell or rent for income or profit! Charming country home, oak hardwood floors, beamed ceilings, adjustable skylights, red brick fireplace, redwood kitchen cabinets, 8x14 wood storage sheds, horse stable, panoramic mountain views! Spa in large private patio. Private, country feeling yet minutes to beaches, downtown, mountains, & freeways. Live in house while expanding or building another house or ADU rental on lot. By Appt Only. Neighborhoods: Calavo Gardens Complex Features: , Equipment: Dryer, Shed(s), Washer Other Fees: 0 Sewer: Sewer Connected Topography: ,LL,GSL"
"Welcome to this 3-story 4B/3.5B home located in the highly desirable neighborhood of Mount Helix! This home sits on a lush 21,780 Sq.Ft. lot with its own gated front entrance that gives it a Victorian Feel. Enjoy a game of tennis on your full size tennis court. There is an abundance of parking with a circular driveway and 3 car garage with RV parking on site. Walk down the custom tiled bridge leading to the double front doors. Neighborhoods: Mount Helix Equipment: Garage Door Opener Other Fees: 0 Sewer: Sewer Connected Topography: LL"
"PRICE REDUCTION: Welcome home! Great Views! An easy walk to restaurants & shops in trendy downtown LM! Original owners of this custom home are ready to downsize - 2018 updates include: New roof, windows, interior/exterior painting. Kitchen, bathroom and flooring ready for new owners to add their own touch. Enjoy the view thru wall of windows in open living area. Private MB ensuite w/ 2 closets & retreat for nursery/office, private balcony. 2 guest BRs have walk-in closets & storage..(see supplement) Neighborhoods: Highlands Equipment: Garage Door Opener Other Fees: 0 Sewer: Sewer Connected Topography: LL,GSL"
"Price reduced, bring offers. Owner may carry. Beautiful single level contemporary home with panoramic views. 3 Bedrooms, each with its own bathroom plus an extra finished storage/ office space below the house. Sit and have evening meals on the expansive patio as the sun sets. The 60 inch commercial stove make this a genuine entertainers paradise. Just under a full acre of luxury. Neighborhoods: Mount Helix Other Fees: 0 Sewer: Septic Installed Topography: GSL,SSLP"
"PRICE REDUCTION! Enjoy spectacular panoramic valley views from this bright, airy, secluded split-level home. Relax among fruit trees and palms from multiple outdoor settings, including a fantastic pool and Lanai. The lower floor offers a large family room with fireplace, 4th-bedroom and wet bar off the pool area providing for great entertaining and room for overnight guests. Highly regarded schools - Fuerte Elementary, Hillsdale Middle and Valhalla High School are all close by. Neighborhoods: Mount Helix Equipment: Pool/Spa/Equipment, Range/Oven, Shed(s), Washer Other Fees: 0 Sewer: Septic Installed Topography: GSL"
"Stunning Mt. Helix single story GEM on a quiet cul-de-sac with room for everything! This move-in ready charmer features a beautifully remodeled kitchen and bathrooms, combination living/dining room PLUS step-down area that's ideal for entertaining, separate family room off the kitchen, large bedrooms, soaring ceilings, wood floors, and so much more. The expansive yard has so much to offer - grass space, lush landscape, covered AND uncovered patios, and mature fruit trees. Welcome home! Neighborhoods: Mount Helix/Helix Knolls Other Fees: 0 Sewer: Sewer Connected Topography: LL"
"Oceanview Mt Helix home brings old world charm to new. Unique upgrades include knotty pine vaulted ceiling, travertine & rustic wood floors, wine cellar, lg butler pantry, high end stainless kitchen appliances with granite, wet bar that spans great room, koi pond, fruit trees, multiple water features, enormous wrap-around deck, tree built into home interior, game room, library, open master great room has 20+ft ceilings w/ floor-ceiling windows. Must love character in a home to truly appreciate it. Neighborhoods: MT. HELIX Equipment: Dryer,Garage Door Opener, Satellite Dish, Shed(s) Other Fees: 0 Sewer: Sewer Available Topography: GSL,SSLP"
"You ll arrive to a grand canopy of trees leading you down the driveway and into a world of your own. This great escape is nestled in the trees surrounded by seclusion offering complete privacy. Expansive windows capture the view reaching out to the top of Mt. Helix. You can see the cross on top of Mt. Helix basking in the bright blue San Diego sky! The classic 1966 Mid Century Ranch architecture offers exposed beam ceilings and panoramic picture windows bringing out the best in this custom design! Neighborhoods: Mt. Helix Equipment: Pool/Spa/Equipment Other Fees: 0 Sewer: Sewer Connected Topography: LL,GSL,SSLP"
"$899,900 to $949,900. PANORAMIC VIEWS, SUNRISE, SUNSET, CITY LIGHTS in Serramar, centrally located & highly desirable La Mesa neighborhood! One of the largest lots. PAID SOLAR. View multiple 4th of July firework shows! Views of metro San Diego, Coronado & beyond! TWO master suites, 1 upstairs & 1 downstairs. 5th optional bd. Upgrades include granite counters, SS appliances, designer cabinetry w/ large island perfect for cooking & entertaining, recessed light, fireplace in fam rm. Low water use garden. Neighborhoods: Serramar Equipment: Range/Oven Other Fees: 0 Sewer: Sewer Connected Topography: LL,GSL"